Human Foosball Game On Rent .Human Foosball game is most energetic game that is being played these days in collages and schools. Human Foosball Game For Event. 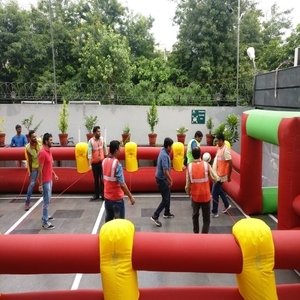 Hence this game is same like football game , but played inside 20 ft by 10 ft area surrounded by air bouncy , if ball goes outside the bouncy area it will be called faul , but you will not get the opportunity to throw the ball by hand as the area is small , the opposite team will get the ball and the game started from there . Human Foosball Game In Delhi. Therefore Human Foosball game is played between two team , each team having 4-5 player in it . Time period for this game is half an hour , those team who will score more goal will win the match. Human Foosball Game For Rent. 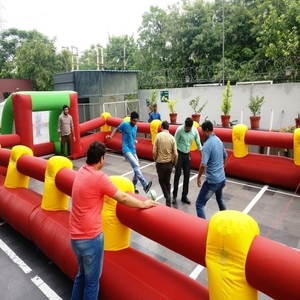 Human Foosball is new adventurous game that is being provided by birthday planner , just experience the feel of football , we provide human football game on rent in delhi ncr at very affordable rate. It will be a great fun to play this game. Human Foosball Game For Hire. 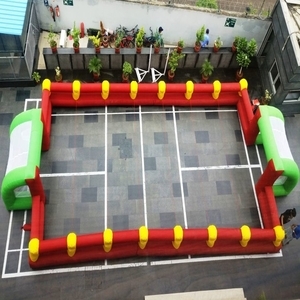 Some other related games Toy catcher machine , Basketball game , Merry go round and even more .. Human Foosball Game For Event.